Polyalthia longifolia (Mast Tree) - Richard Lyons Nursery, Inc.
About 40 years ago, a Miami couple fresh from a long trip to Asia brought seeds of an attractive Indian evergreen tree to Fairchild Tropical Garden. Over time this species, Polyalthia longifolia (a/k/a P. longifolia var. pendula), has proven to be a very successful introduction to the landscape of southern Florida. Commonly known as the Mast Tree––ship masts are among the products manufactured from its wood––it is pyramidal, or spindle-shaped, and capable of reaching 30+ ft. in height. 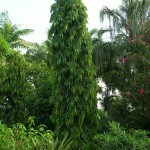 It features long drooping branches and dark green, lance-shaped, glossy leaves with undulating margins. Polyalthia provides an excellent alternative to Italian Cypress, which in southern Florida is prone to spider mites and fungal disorders. 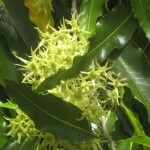 Another advantage of the Mast Tree is its cleanliness; it does not shed. Needing light pruning just every 1-3 years, this species fits the definition of low-maintenance. Not surprisingly, P. longifolia trees in southern Florida have recovered well from Hurricane Irma. The Mast Tree is classified in the same family as Ylang-Ylang, Custard Apple and Soursop, which were introduced to our area much earlier. In the landscape of bustling Asian cities, the Mast Tree is often used to soften noise. Aside from its ornamental appeal, Polyalthia is said to contain medicinal properties. (In fact, the genus name itself is derived from the Greek words for ‘many cures.’) Studies reputedly confirm antifungal and antibacterial capacities, as well as usefulness in combating ulcers, fever, hypertension, diabetes, and certain cancers. At Richard Lyons’ Nursery, these handsome trees are available in 3-, 7- and 15-gal. sizes.